– Displays a real-time Twitter feed of all tweets referencing #itscominghome so you can keep up to date with all of the England football related memes. 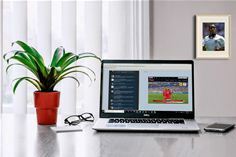 – Allows users to just click a button to watch the football from within Visualfiles, either by live streaming a match, or by watching one of many replays available on demand. – Provides a fully customisable Twitter feed so you can display other England football hashtags. – Enables users to change what video player is used, whether that is BBC iPlayer, ITV Hub or TVPlayer.com.